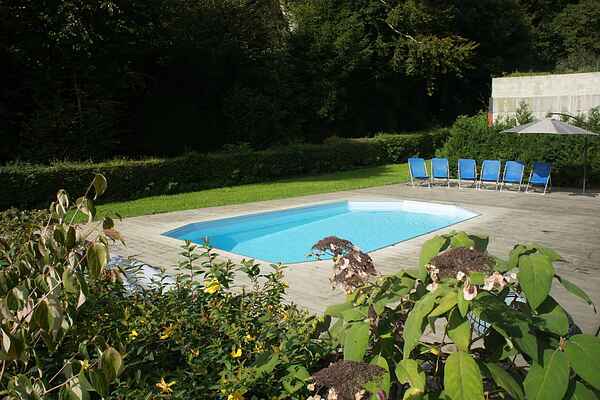 Composed of 3 independent and separate parts, this cottage on the farm offers a stay in Neufchâteau. Ideal for families wishing to relax in a pleasant environment. Surrounded by meadows and woods, this cottages is located in a quiet and relaxing area. Each season will offer its various charms. Decorated with care and passion, this holiday house offers a comfortable interior. Taking advantage of the sober and cozy style, your group will be able to immerse in a local atmosphere. The holiday home hosts a beautiful private garden and terrace. You are sure to enjoy the many activities offered by the outdoor games (swing, petanque, sandpit ...), the pool or the beautiful pond. Enjoy preparing a delicious barbecue while the children play with the dog on the lawn or in the pool. To enrich your stay we recommend a walk to neighboring villages Neufchâteau (4 km), Libramont (7 km) and Leglise (10 km).